Scottish shooting estate home to ‘extinct’ species. Surveys revealed a wealth of rare plants, birds and animals, including black grouse, water vole, pine marten and the lesser butterfly orchid. The discoveries were made when surveys were carried on the estate by conservation charity, Trees for Life. All the threatened species (some considered extinct) that were discovered are included in the UK’s Biodiversity Action Plan as priority species for conservation action. An innovative project on the estate is also trying to use wild boar to reduce the amount of bracken in an area of ancient birchwood, to help the regeneration of native trees and flowering plants. The boar, donated by the Royal Zoological Society of Scotland’s Highland Wildlife Park at Kincraig, live in a special woodland enclosure. Alan Watson Featherstone, executive director of Trees for Life, said he got very excited when rare species were discovered, and added that it was “reassuring” to find creatures thought to have vanished forever. Dundreggan was previously owned by an elderly Italian who used it the estate for shooting and hunting. 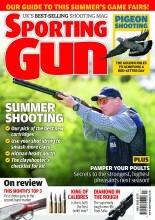 Talk to other readers about shooting and conservation!